Stampologist (noun) Someone who is addicted to acrylic stamps and uses them to create cuteness and beauty to share with the world! The other day I got a call from my darling daughter who is off at college asking about Halloween costumes. Her dorm is putting together a fun party for the kids and she wanted a little something cute to wear. I pulled up a couple of the cartridges from my new Cricut Subscription that my husband bought me for my birthday this year (thanks Mark!) and asked her which cuts she liked the best. Here is what she picked and what I created. These came out so cute! I used some metallic paper I had on hand for the reflective silver (just in case they are doing outdoor stuff for the party) and lots of dots of Glitz Glitter Gel to accent. The orange fox paper is from our Scaredy Cat Paper Pack. The noses are both glitzed and then I added a layer of Liquid Glass on top to keep the glitter on. The cat's eyelashes are outlined on the tops only with Liquid Glass too - tres chic! 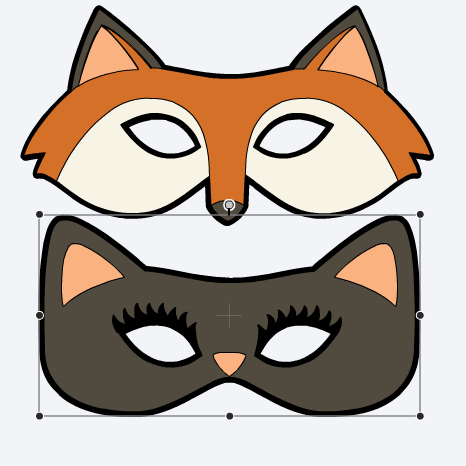 Since I had to figure out the sizing for these cuts for an adult face I figured I'd share the file here so people don't have to go through the sizing process like I did - LOL! To make them into a wearable mask I also added 18 inches of grosgrain ribbon to each side and cut a second black base layer to sandwich the ribbon between two black layers making the masks pretty sturdy. I did use liquid glue for all the layers to ensure a really good bond and a strip of Score Tape under the ribbon tab on each side. Now I need to make one of these cuties for me! These masks are adorable Paige! You are so talented and creative! These look like they are soooo much better and more durable than any store bought mask! ! PLUS, they were made from the heart by Mom! Thank you for sharing your creative file! ! Thanks Trish! You are so sweet! I sent a picture to my daughter and she is very excited about getting them in the mail. The best part about making things by hand is that they are always one-of-a-kind so she is sure to have something no one else does! And I was able to size it so she can wear her glasses underneath if she doesn't want to do contacts! Join us a Heart2Heart for weekly CTMH challenges! I'm a stay at home Mom blessed with three terrific kids and a wonderful husband of 24 years! I am also a Close to my Heart consultant which gives me a creative outlet, inexpensive stress therapy and a good excuse to get together with friends! Will Blog for Followers... Sign up here and make my day! Heart2Heart Challenges - Anything BUT a Card! Heart2Heart Challenges - Hip to be Square! Adventure Color Palette with Heart2Heart Challenges! CTMH November Stamp of the Month "Around the Block" Blog Hop - Gingerbread House Treat Boxes with Tutorial! Copywrite - or sharing the love! Thank you for visiting me here on my blog today! I hope you have been inspired by my postings to create something lovely for yourself! It does take me a whole lot of time to create the artwork, tutorials and posts for this blog so if you would like to borrow my wording or artwork then I respectfully ask that you e-mail me for permission, credit me and/or link back to my blog. Thanks for your understanding and respect!